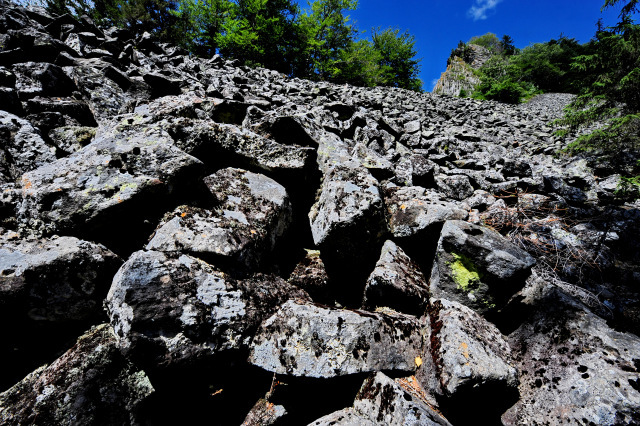 Located in the Metaliferi Mountains in Transylvania, Detunatele (the Thunderstruck Rocks) are columnar jointed volcanic rocks and one of the major tourist attractions in the region. In order to be able to enjoy their view, you have to go to the south of the Apuseni Mountains. The route starts in the Bucium village, about 70 kilometers from the city of Alba Iulia. 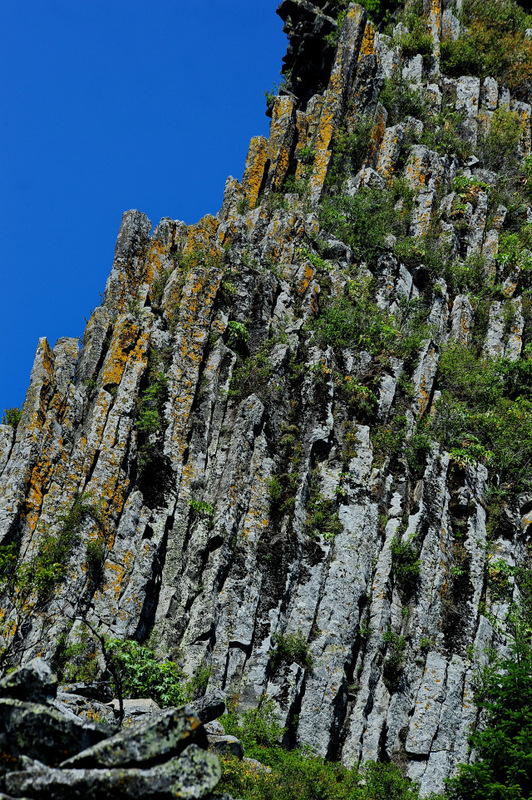 The basalt massifs correspond to the third cycle of the Neogene eruption and the weakest one ever to take place in the Metaliferi mountains. Detunatele appear in the shape of two volcanic rocks, almost 70m high, visibly emerging in the relief. They represent witnesses to erosion, separated from the sedimentary formations of the leveling surface known as "Abrud platform", dating from Miocene. The two protected areas have a surface of 24 ha, respectively 20 ha. Some say the names of Detunatele come from the sound of stones when they fall from the massif, but that happens quite rarely. Actually, the whine of the wind among the huge basalt fragments produces a sound similar to a thunder. 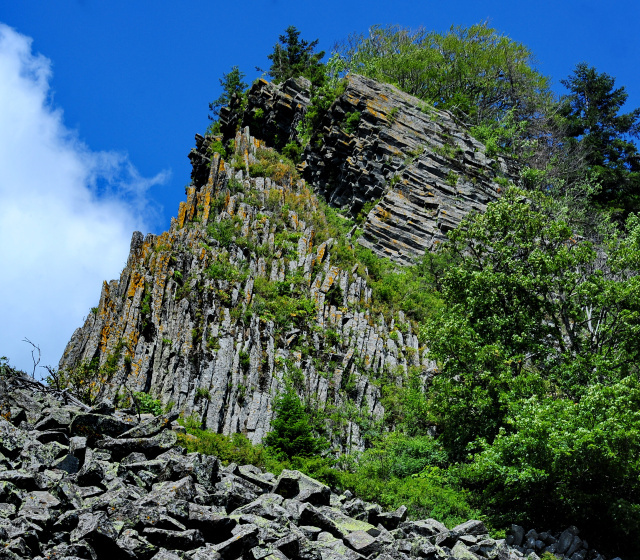 The two Thunderstruck Rocks in the Apuseni Mountains are located one and a half kilometer away from each other. You can only visit Detunata Golasa (The Barren Thunderstruck Rock - 1168 m), because it does not exist a path marked towards the Detunata Flocoasa (The Shaggy Thunderstruck Rock - 1265 m) which owes its name to the spruce forest that covers it. These formations are shaped like humps and there are stories and legends associated with them. One of these says that in the days of old, giants and fairies were living here, but the giants hated the fairies and tried to kill them. 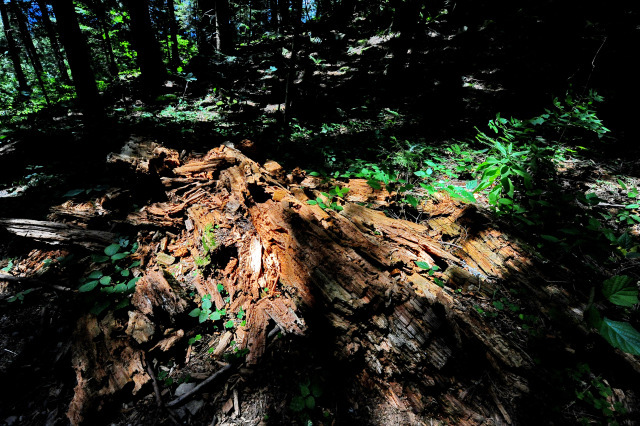 The son of the giant`s ruler was sleeping in the woods one night when he was attracted to the song of a fairy. The two fell in love, but their story came early to an end because of the giant`s ruler, who followed his son and killed the fairy. Angry, the young giant stabbed his father with a dagger. As a result of this episode, the earth opened and flames came out of the deep, turning all of them into these stone walls. One of the most prominent personalities who visited this place was Franz Joseph, the emperor of Austria, in 1852. Today Detunatele represent a nature reserve and a tourist attraction of great interest due to the prismatic columns that are to be found in very few places around the world.